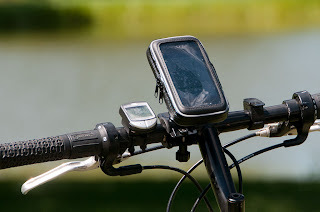 Whether your bike travels take you through desert or city, mountains or beach, chances are you are packing your iPhone and using one of the many GPS or other bike apps. I hate to admit all the crazy ways I tried to attach my iPhone to my handlebars before I discovered the new Bracketron mount. 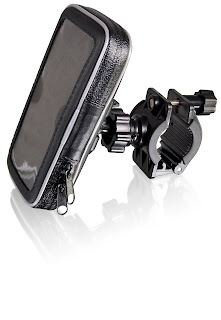 Bracketron has been making car dashboard mounts for cell phones for years, but just recently introduced this model for the biker. Luckily I never completely dropped my phone, but with this new mount I’ll never have to worry again. The mount couldn’t be easier to use. First, you unzip the water proof wallet that will house your iPhone or other device. There are multiple thickness cushions included so you can get just the right fit. Next, you unscrew the thumb-turn wheel that attaches the bracket to your handlebars. No tools are needed or suggested. After placing the bracket around the handlebar, you simply tighten in place and adjust the angle for comfortable viewing. At first I was concerned when I saw the plastic, touch-enabled screen that would be covering my iPhone while in the case. I was concerned that I would experience a lot of glare reflected in the bright sunlight. Turns out that I noticed no glare whatsoever, primarily because I had adjusted the angle properly when installing the unit. The entire unit weighs but a couple ounces and sits very, very firmly on the handlebar, making an excellent enclosure to protect your iPhone from dust, dirt and heaven forbid – rain. Hopefully I plan to bike most of the island of Taiwan this fall in connection with the 2011 Taiwan World Cup bike race, and this is one of the few bike accessories that will surely be in my bag for the trip. Last year the event was rained out due to Typhoon Megi, but hopefully the weather will be better this year. If not, at least my iPhone will be protected. See it online at the Bracketron website or order online from their many retailers.